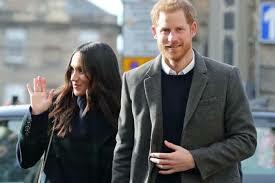 Prince Harry and Megan dressed in Tartan and Scottish Cashmere visited Edinburgh facing a day out in the cold. The Scottish Cashmere Company was there to see the couple greet all the fans and supporters on a cold morning in Edinburgh. Meghan and Harry’s trip marked their first official joint visit to Scotland. During their visit, the pair learned more about organisations that work in the local community and nationwide, and celebrate youth in the Scottish Year of Young People 2018.